I have had a love affair with beets my entire life. It all began with the lowly pickled beet that was served at every company dinner when I was growing up. You have to remember that living in the Midwest many years ago (not going to say how many), we didn't have the amazing access to fresh vegetables year round like we do today. All kinds of fancy Jello salads and pickled beets were necessities to fill out the meal. When our family moved to California in my early teens, these items weren't as common as the warmer weather and longer growing season extended the availability of fresh produce. And over time, bringing fresh in from around the globe changed everything. Once in a restaurant I even had a salad topped with raw beets that had been finely grated. It was interesting - crunchy with great eye appeal. It wasn't until I had kids and a garden in the back yard that I rediscovered my love of the lowly beet. I tried my hand at canning pickled beets and they were an instant hit with my kids. I also began to serve them cooked with just a tad of butter, salt and pepper, and found a new passion. The pickled beet faded from my table and I began to embrace the unique flavour this vegetable offered on its own. My kids received this with mixed feelings, but I didn't care. Traditionally beets have been boiled until tender, peeled and diced. A few years ago, however, I discovered recipes that offered them roasted. SOLD! I loved the fact the process was less messy and the beets developed a more intense flavour. It's been a long time since I saw anything new done with beets, but Holly of Happy Food Healthy Life has done just that. She cooks slices of raw beet on the grill. I am totally intrigued. For the most part I only share recipes I have tried, but can't wait on this one. It's top of my list of things to make when spring brings barbecue season. If you decide to try it as well, Holly asks that you snap a picture and upload to Instagram tagging @happyfoodholly and hashtagging #inspiredbyholly. Preheat grill or a cast-iron grill plate over your stove to medium low heat. In a small bowl, toss the sliced beets with olive oil and a few dashes of salt and pepper. 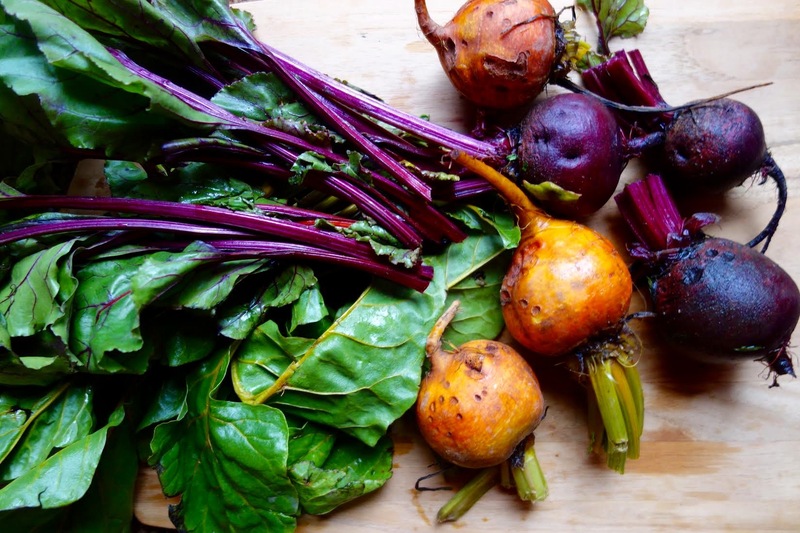 Be sure to toss the yellow beets separately from the red beets, so the red color won't bleed onto the yellow. Once grill is to heat, place beets in a single layer and cook slowly until there are nice char-marks, about 8-10 minutes. Flip and cook the other side until the beets are fork-tender. While the beets are cooking, you can start on the balsamic reduction. In a small saucepan, heat the balsamic vinegar until it comes to a rapid boil. Reduce heat to just a simmer, stirring occasionally until the vinegar has reduced to about half it's original amount and is a syrupy consistency. Remove from heat. Place chopped almonds and agave in a small pan on low heat. Stir often and keep a close eye on the almonds. Make sure they are all coated with agave. The agave will become a deep brown color, and as soon as that happens, take it off the heat. Any longer and it will burn, and you do not want that! Put the almonds on a plate and using a fork, separate the individual almonds so they aren't stuck together in one big clump. Place the kale in a large pan over low heat. Sprinkle a few drops of water in the pan and cover to create a steam. Let sit for about 2 minutes just so it can soften a bit. Use tongs to toss the kale around. You want it to wilt just a tiny bit so it still holds its crunch and color but it more pliable. Either microwave the flatbreads or warm over a pan. Brush with a small amount of olive oil. Divide the kale between two flatbreads. Top with beets, candied almonds, and feta. Drizzle with the balsamic reduction. Cut into individual slices.